The brightest reds, yellows and oranges lit up the trails ahead of me today as I came within 10 seconds of a personal best half-marathon on Prince Edward Island. This race was sweet. It was flat, cold and clear after the rain clouds parted mere minutes after the gun sounded. But the colours, oh, they were the highlight. But really, anything under 2:05 seemed like a stretch for me, based on my training runs and my August half-marathon time of 2:10 on the much hillier Saint John course. So I was flying high by this point! The weekend started on Friday night. 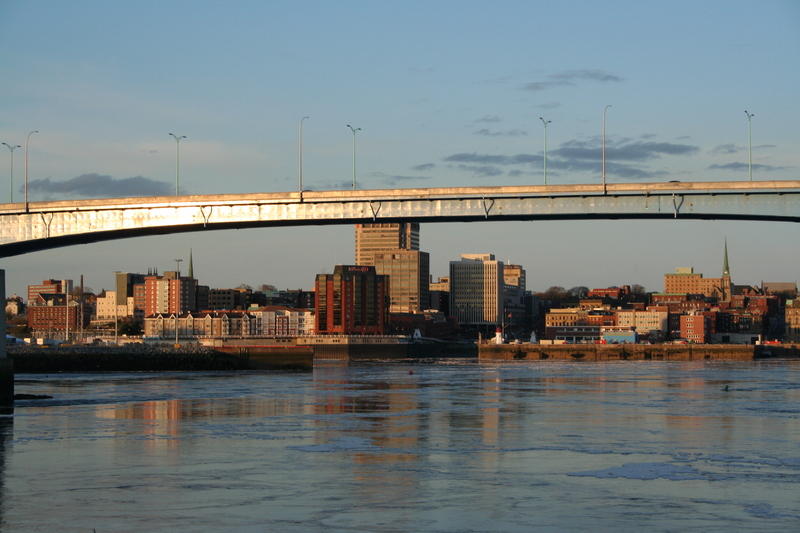 My husband, 15-month-old son and I drove from Saint John to Charlottetown right after work, arriving around 8 p.m. 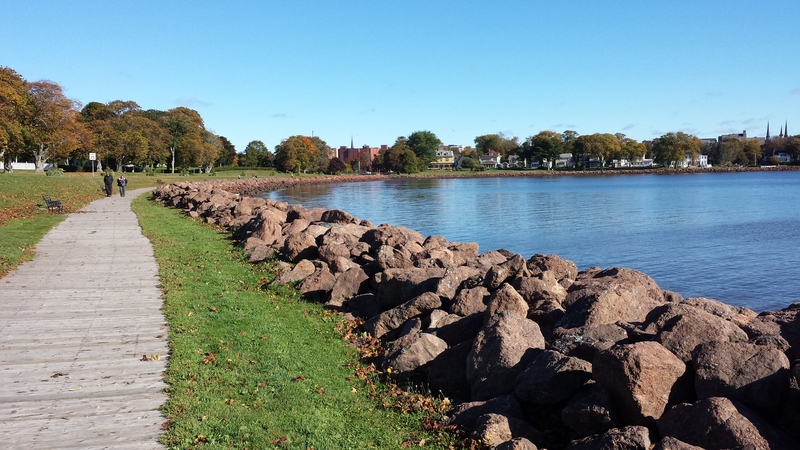 It gave us all of Saturday to enjoy Charlottetown, go for a drive to allow Silas a nap, and enjoy some great food. We checked out part of the route along Victoria Park. We had lunch and pumpkin ale at the Gahan House. I ate lobster sandwich and had a salad. I ate a cookie with a coffee during a drive to view the colours around Brudenell and Montegue. After a quick dip with Silas in the hotel pool (and as I chugged water, realizing I had not drank enough all day), we ventured out for the pasta dinner. 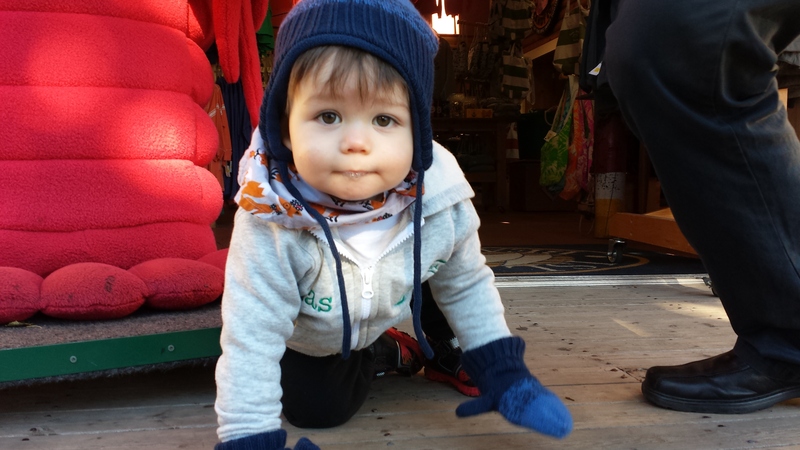 But to our disappointment, there was a long line-up by 6 p.m. Not great with a one-year-old. So we tried Piatto Pizzeria and it was awesome. I enjoyed a barbecue chicken pizza and Mark had a calzone. We fell asleep super early. After putting Silas to bed in his pack ‘n’ play around 8 p.m., we stayed very quiet in the dark waiting for him to fall asleep. But we fell asleep too! So it was pretty easy to wake up when the alarm sounded at 6:30 a.m., giving us plenty of time to eat (I had toast and a banana with a coffee) and get to the start line. Since it was rainy and cold, Mark and Silas dropped me off so they could do their own thing while I waited for the race to start. 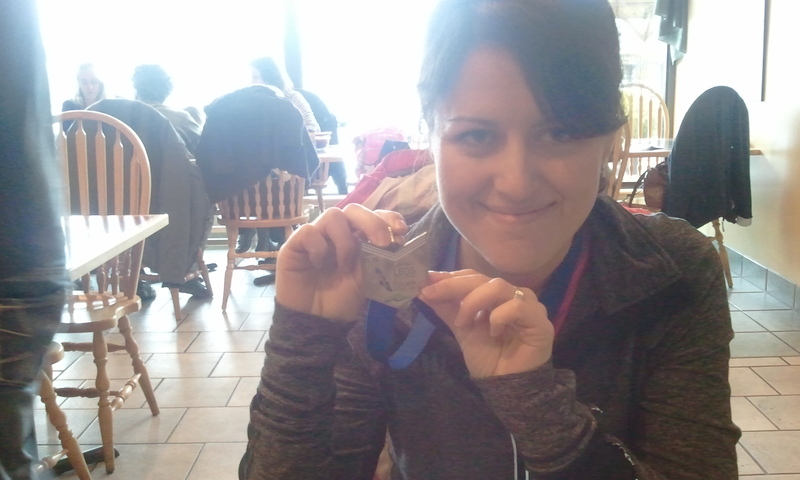 I was dreading being wet and cold for 21.1 kilometres. But luckily, just as the gun sounded, the skies seemed to clear. It made for a beautiful run. It was crisp and the bright sun shone on the fall leaves. It felt like I was running through a picture at some points. 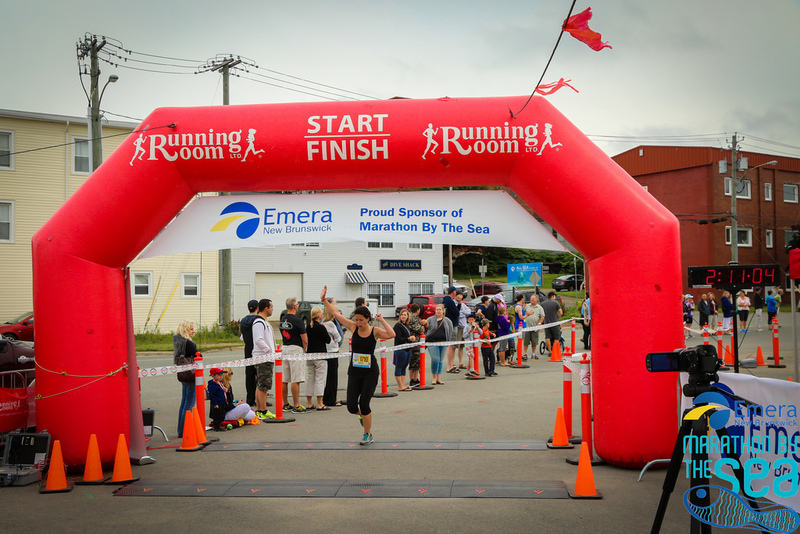 The race started out meandering through Charlottetown neighbourhoods along the harbour and North River before crossing inland toward the Confederation Trail. 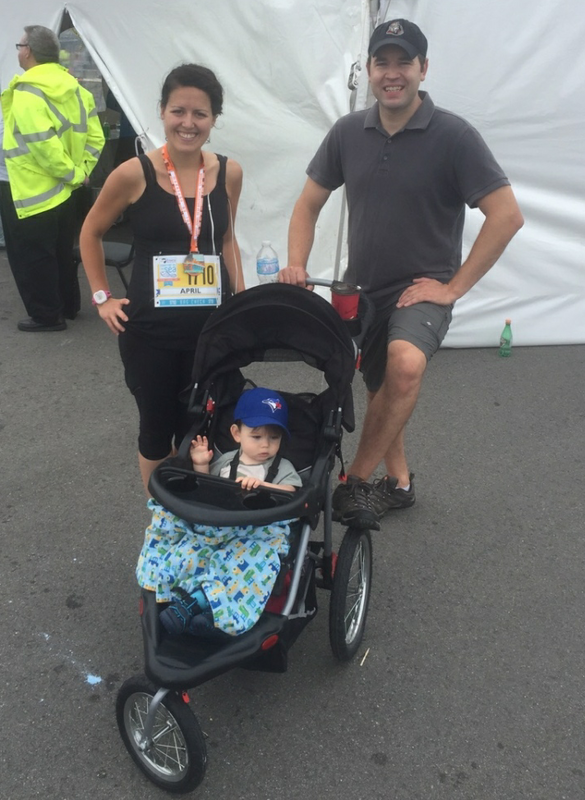 I kept up a brisk pace through the first half, finishing 10K in less than an hour. I didn’t think I could keep it up and wondered about my strategy for the remainder. 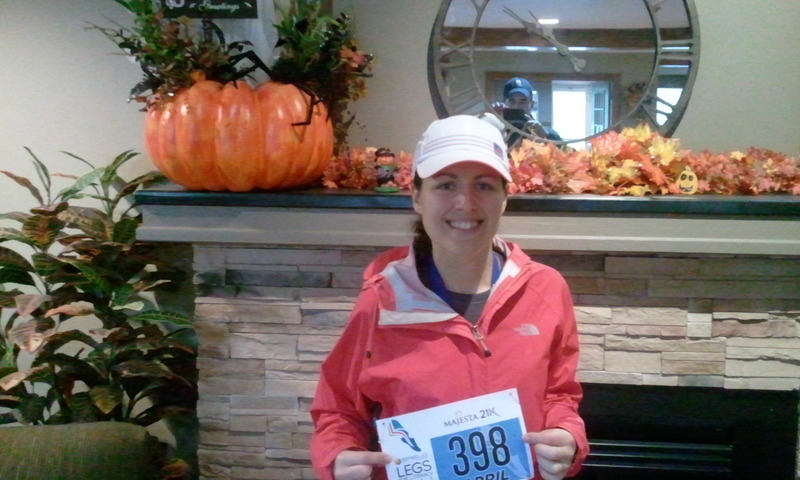 Should I keep running as fast as possible or pull back to conserve energy? I decided to plow ahead, and worry about the consequences later. Worst case scenario is I do a lot of walking, I thought. Around 11 km, the two-hour pace bunny came up behind me. I tried to run ahead, but the bunny kept up with me. So I made my new strategy to join the two-hour pace group. At first, I loved it. I fell into their brisk pace, followed by 1-minute walking breaks every 10 minutes. But then I felt winded, and realized I couldn’t keep it up. I decided to give up on the idea of getting a sub-two-hour time. I fell into a new rhythm around 16 km and headed downhill toward University Avenue, the long final stretch. Then, I had to dig deep. I was sore, my legs felt wobbly and I wanted to walk. But my pace was still good (well under my goal of 6 min/km), so I pressed on. I did walk on a couple of hills, but I was getting closer to the two-hour pace bunny again. 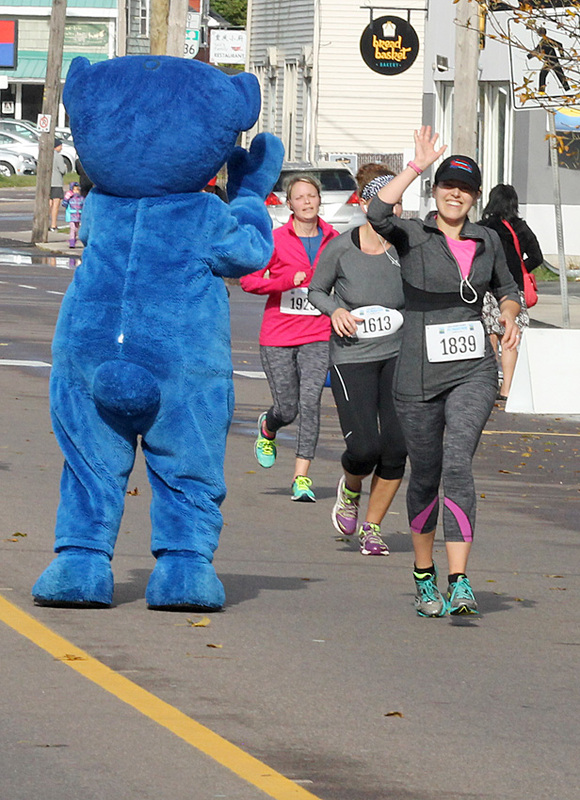 As I reached the final two kilometres, I saw the bunny stop and start to cheer people on. He even turned back to help some runners behind me. I looked at my watch and realized a two-hour run was within reach. I never thought it would be possible, but I was on pace. The final kilometre felt long and I struggled to keep up a good pace. Taking out my earbuds, I could hear the cheers by the finish line, at Province House. I high-fived the mascot and waved at my friends, Kevin and Kathy (thanks for the pics!) I pushed to the finish and started to cry a little. I did it! At that point I thought it was possible I had a new personal best. But according to Atlantic Chip, my final time was 2:00:03. I thought it might be a little faster because of my chip time, but from what I understand, only gun time was measured. 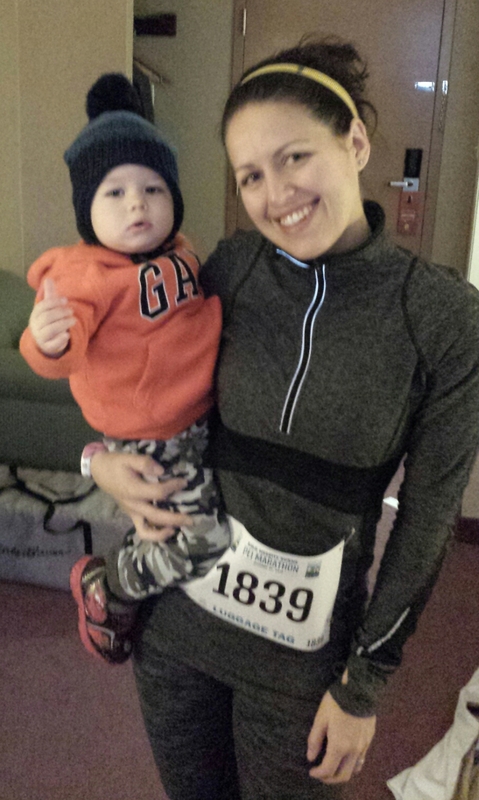 Now back home, I can’t help but feel how lucky I am to have had the opportunity to run in all three Maritime provinces this year, with my husband and son there to cheer me on. 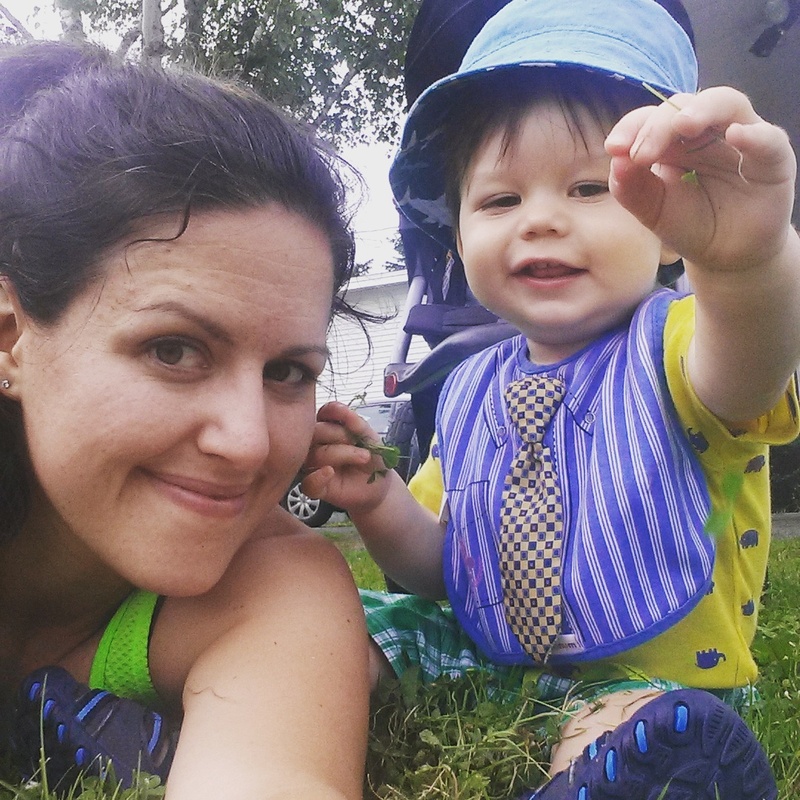 I never had faith that I could get back into running so seamlessly after becoming a mother. I get that. I’m kind of addicted to it. 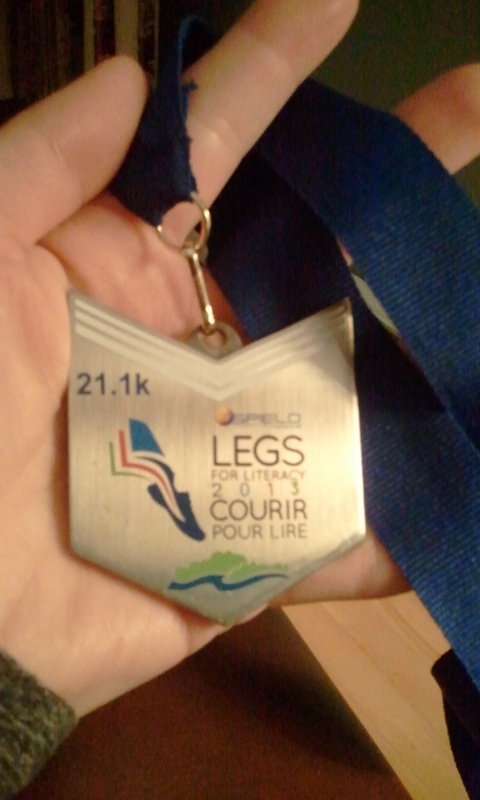 There’s still a chill in my bones after running the Legs for Literacy half-marathon in Moncton today. But there’s also a skip in my step – I beat my personal record. I ran my third half-marathon of the season in 1:59:54, under that sought-after two-hour barrier by the skin of my teeth. Damn, the victory is sweet. The weather was absolute dirt. It was the kind of yucky late-fall day that makes you shudder just to look out the window. Bitter cold, hovering above zero. Wind and spitting rain. But, somehow, it all added up to a great race for me, from beginning to end. The flat terrain of Moncton made for smooth sailing the entire time. I wanted to rip from the beginning (to warm-up, really) but held back my pace between 5:30 mins/km and 5:45. My goal pace was 5:55 but it felt way too slow. The route involved three segments of the riverside trail, in an out-and-back format. Coming from Saint John, where you couldn’t avoid a hill if you tried, I can’t even express how delightful it felt to keep up a brisk pace on flat terrain. Yes, it was wet and cold, but it didn’t seem to matter. Once my body warmed up, I was OK. My hat kept the water off my face and my clothes were moisture-wicking. More than once I hung in runners’ tail winds, tagging on to their paces, then when I felt like they were slowing down, I zipped on by. When I got to the 15 km mark, I started rejoicing. I knew I was feeling good and that six more kilometres would not slow my pace. I kept it going as best as I could. Before long, the two-hour pace bunny was at my rear. I ran with the group until they stopped for a walk break, and I kept on going, managing to just keep ahead of them the rest of the way. The final couple of kilometres were more challenging, but I just kept pushing, knowing I had a new PR (beating 2:01:40). Getting in under two hours would be icing on the cake. For the last leg, runners leave the trail and run about a block to Main Street, where the crowds are waiting. For some reason, that last piece before the turn is so hard (I remember that from last year’s 10 km). But rounding the corner, I emptied the tank. I picked up speed, and passed other runners on the home stretch. I saw the timer at 2:00:10 and was filled with glee. I knew my chip time would get me under the two-hour mark. As I crossed the finish line and was directed to pick up my medal, my heavy breathing turned to sobs. I was just so happy. By this point, it was no longer spitting, but raining. And my thin shirt was no barrier to the cold. I started shivering and looking for Mark – who ran his own killer 5 km race today – but he was nowhere to be found. I was wandering aimlessly for about 10 or 15 minutes, which felt like forever, before I found him. I was kind of panicky and still emotional, but it was nothing a hot shower couldn’t fix. I have no good pictures of the best race of my life, because the shoddy weather did not make us feel like sticking around for glamour shots. Post-race at the hotel. You can see my photographer in the mirror. Check out this bling. All I can think about is my lunch. But here is what is stamped on my memory forever: 2013 has been an epic running year. 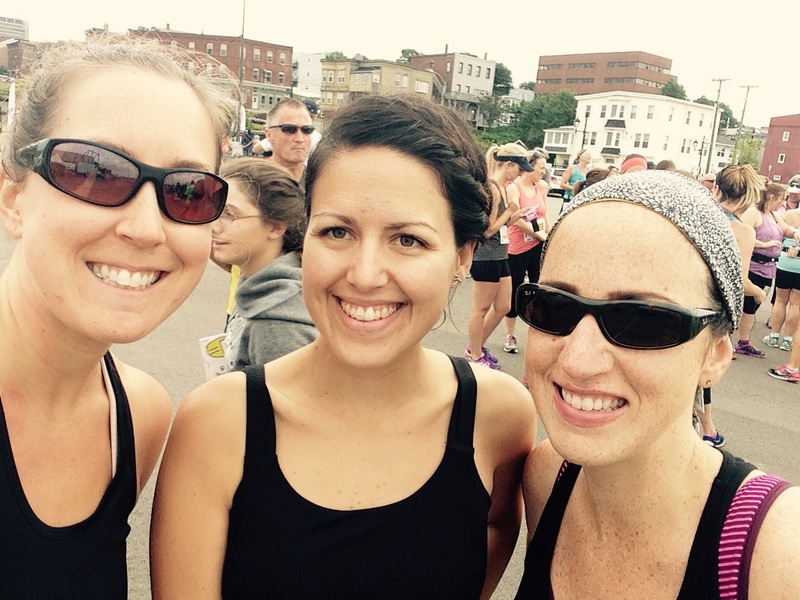 Three half-marathons, a 10-miler, a 10 km, a 5-miler, and a couple fun runs. Each one better than the last. I am so grateful to have discovered and enjoyed this sport that has introduced me to so many great people and has enriched my life in so many ways. There is no feeling out there quite like it: pushing your legs and heart are hard as you can. It hurts but it also feels good, makes you feel like you can take on anything. Do anything, be anything. 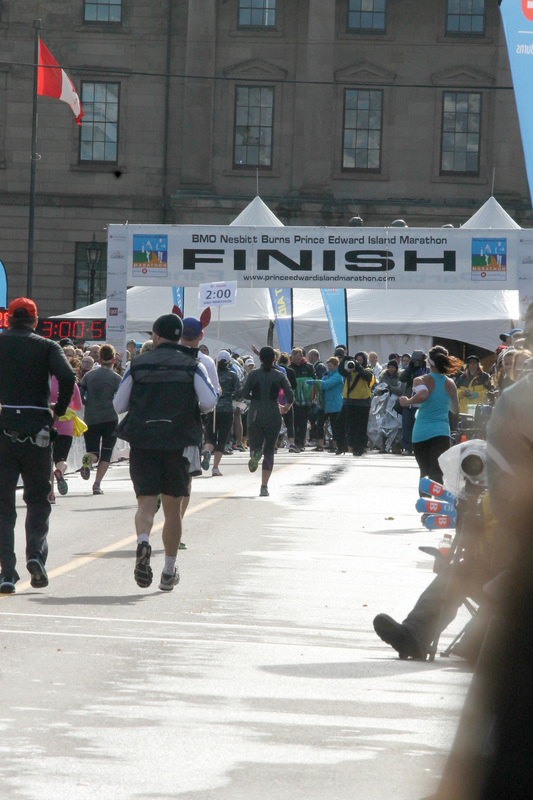 In summary: Legs for Literacy half-marathon in Moncton, N.B. It’s a double race weekend! 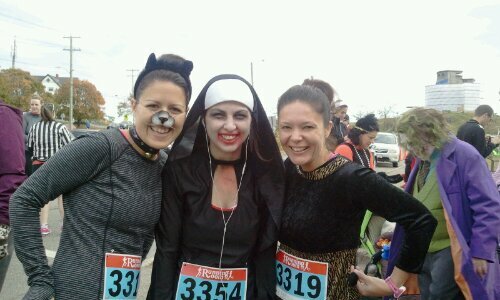 Goblins, zombie nuns, giant Lego blocks and lots of cats scampered through the streets of Fundy Heights this morning during the Creepy Crawly 5K. It was my first time taking part in the event, and what a blast. Yes, it was a bone-chilling 4 C, but the costumes and spirit were fantastic. 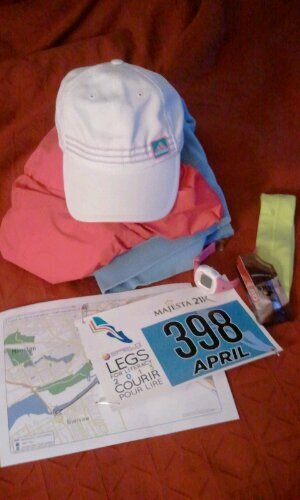 It was a great way to get my legs moving for tomorrow: my last big run of the season, the Legs for Literacy half-marathon in Moncton. Time to beat is a swift 2:01:40. This will be my third half this year, and my fourth ever. I’m feeling relaxed, full of carbs and ready for whatever tomorrow brings. Just please, no snow.